In 1908 W.G. “Jack” Farr made his syndicated comic-stripping debut with a short fill-in stint in the World Color Printing Sunday comics section. However, the first strip in the substantial list of his own creations was Little Willie, which had a pretty long run in Hearst’s New York American from February 26 1909 to April 17 1910. Farr showed no particular genius at first in this very conventional strip about a kid who has a bit of an attention span problem. The concept had been done before, many times, and what the American editor saw in it I can’t fathom. 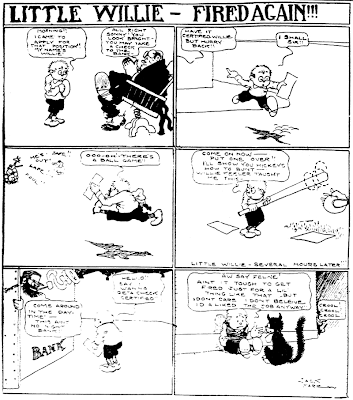 But Farr did improve, and though he was never considered a cartoonist of the first rank, he knew how to crank out the funnies, practically taking over the New York Telegram in the mid-teens and chasing off all that interesting content I spoke of last week in the post for Pazaza, It’s Great.